Transfer deadline day never fails to generate huge levels of excitement amongst the football community. Outside of actual football, it’s the most fun a fan can have, watching Sky Sports News as hysteria outside Stoke’s training ground reaches fever pitch – supporters praying for that one player who could be the making of their season or anxiously hoping to keep hold of that player that the vultures in the top four have been circling around for a while. After the summer that Watford have had, deadline day had lost its lustre. There was probably a star player somewhere in the ten players we have already acquired, and with the squad fit to burst, any incoming transfers would be unnecessary. In addition, with the Pozzos bringing some sort of financial stability there was no need for our stars to become carrion. There was, therefore, a lukewarm reception to the news that six further players had agreed to pitch their tent in Hertfordshire. Jean-Alain Fanchone was one of those. Of the names that were announced on Friday, his was the most expected after the Watford Observer had reported his arrival a week prior. Most of the five Udinese-based deadline day loanees will most likely play only bit parts this season, having been sent to Watford as a last resort. It is better for a player to be at a Championship club and play five or six games than to be at a competitive Serie A side and never even see the bench. And from his history, I wouldn’t expect Fanchone to be too different. The 23 year old was born in Mulhouse, on the French/Swiss/German border, home of The Museum of Electricity (Electropolis), and seemingly little else. He signed his first professional contract with RC Strasbourg, the nearest big club to his hometown, in March 2008, at the age of 19 and made his debut in the first game of the 2008/2009 season in a 3-1 Ligue 2 victory over Dijon. The left back had previously been in the youth ranks at the Alsatian club and in 2006 had defeated a Lyon team featuring Karim Benzema and Loic Remy, to win the Coupe Gambardella, the French equivalent of the FA Youth Cup. In his debut season, Strasbourg finished just one point off of promotion to Ligue 1. Fanchone, who turned 20 two months into the season, started in an impressive 32 of the 38 league matches, scoring twice and not receiving any bookings. The success of his first season in football was not repeated in his second year, Fanchone started 24 games as Strasbourg, who had spent fifty six seasons in the top flight since 1933, were relegated on the last day of the season to the semi-pro Championnat National for the first time in their history, their season disrupted by internal strife which saw the club changes presidents several times over the season. Fanchone did not travel with his childhood club into the depths of French football. Instead, he was thrust into the heights of Ligue 1 with Arles-Avignon, who took him on loan from the slumbering giants slumming it in the third division. The club from the south of France had reached the peak of an incredible journey that had seen them promoted four times in five seasons, having started in CFA 2, the fifth tier of French football, an entirely amateur league. Arles struggled, and didn’t win their first point of the season until their ninth game – a 0-0 draw in Brest. Fanchone started the first six games, before being dropped until the very end of October . The team, featuring a fair few familiar names including Hameur Bouazza and king of the paneka Yann Kermorgant, finished dead last in Ligue 1 that year, the dream coming to an end as they amassed just 20 points. In all, Fanchone made 21 appearances. 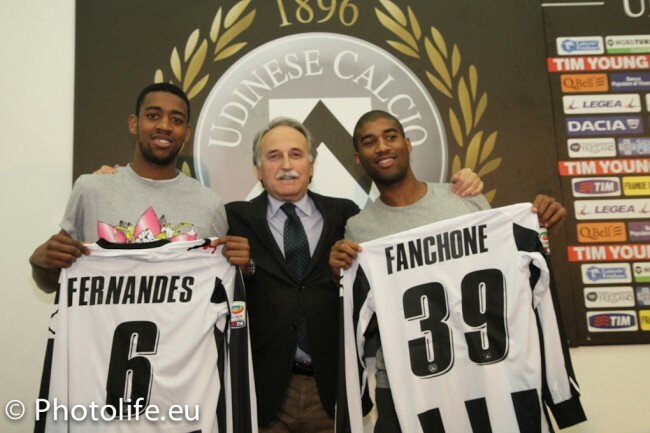 Strasbourg had failed to get out of the National, fourth place not being enough to drag themselves back up, so Fanchone went out on loan once more, to Udinese. He failed to play a single minute for the Friulians, though they did see fit to make the switch permanent in January, contracting him up to 2016. After signing permanent terms, Fanchone did at least make it onto the bench for a Serie A match, watching on with fellow loanees Lars Ekstrand and Cristian Battocchio as Udinese ran out 2-1 winners over Lecce. That was his sole action as a Udinese player (to date) and he arrives at Watford without any first team match experience since Arles’ Ligue 1 swansong at Nice on 11th May 2011. Match fitness could be an issue (quelle surprise). There’s nothing to suggest Fanchone can operate as anything other than a left back, which may spell the end of Carl Dickinson’s Watford career – that is if he can’t establish himself as a centre back! Daniel Pudil will almost certainly remain the squad’s first choice left back, though could be pushed further up the pitch if need be. It is a bit early to be casting any aspersions on any players given the upheaval that the first chunk of the season has seen, but it could be suggested that Pudil’s strengths lie more in the attacking side of the game, or at least, his focus does. If the Czech was pushed further up, there may be a spot for Fanchone to make his mark on English football. To be honest, none of us know where the new players will fit in, which we probably have in common with Gianfranco Zola, but with as big a squad as we have, there should be enough talent to provide a successful season. With this international break claiming only Matej Vydra, Sean Murray and Nyron Nosworthy from the first team squad, Zola has a bit of time to bed the players in and decide on his best eleven.